Included here are all aircraft carriers and seaplane carriers. These pictures are published for pleasure/information/research purposes only and are not for sale or copy under any circumstances. Information in captions has been researched as thoroughly as possible but it accuracy cannot be guaranteed. 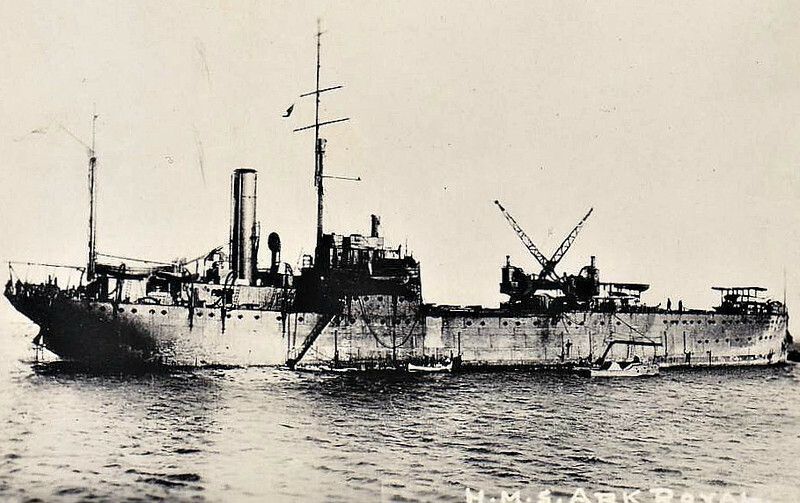 1914 to 1944 - ARK ROYAL - Seaplane Carrier - 7570 tons - 111.6 x 15.5 - 1914 Blyth Shipbuilding & Drydock Co., Blyth - 4x3in., 8 a/c - 11 knots - 1915 Gallipoli, 1916 Salonika, 1918 Aegean Sea, 1919 Black Sea, 1920 Somaliland, 1922 Dardanelles, 1930 Training Ship, 12/34 renamed PEGASUS, 09/39 Aircraft Transport, 1944 Barracks Ship, 1946 sold Commercial as ANITA I (PAN), 10/50 broken up.